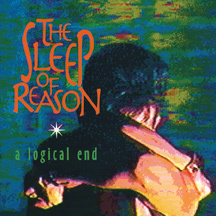 Before there was black tape for a blue girl, before there even was Projekt Records, there was The Sleep of Reason. Back when groups like U2 and Echo & The Bunnymen were still underground cult bands and goth hadn’t been discovered on America’s shores, (Black Tape vocalist) Oscar Herrera’s early eighties “post-punk expressionist rock” band were developing a strong following from their Miami, Florida homebase. Now, Archive brings you A Logical End. This disc brings together the band’s original 1984 QL Records 12″ release The Sleep of Reason (returning the two tracks removed by QL for being too esoteric: “Moloch Machine / Creation”) and a successful live recording taped at Brassy’s in Cocoa Beach, FL. for a WFIT radio benefit.